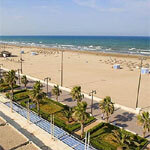 It is the capital and biggest city of the Region of Valencia and of the Province. It is the third biggest Spanish city by population, with 814.208 inhabitants in the city and 1.832.274 in the metropolitan area. The climate is Mediterranean, mild and humid. The average temperature is 17.8 ºC. As a reflection of the history of this city, and of the different cultures that have lived in it, the whole city is an open museum, where hundred-year-old buildings coexist with state-of-the-art constructions. In Valencia you can enjoy natural areas like L’Albufera Nature Reserve and many parks, like the Botanical Gardens (with more than 200 years of history), the Royal Gardens or the old riverbed of the river Turia, where we can now find a park and many facilities, like the City of Arts and Sciences designed by Santiago Calatrava, sport installations or recreation areas like the Gulliver Park. In addition we can find several cultural buildings, like the Modern Art Institute, the Museum San Pío V, one of the most important art museums in Spain, or many Gothic, Renaissance or Baroque churches. The North Station is also a cultural monument, and visited by the thousand tourists that come to Valencia by train. The city’s traditional gastronomy (the so-called Mediterranean diet), rich in rice and fresh vegetables, reflects the culture and environment of Valencia, with many orchard products and sweets. The basic ingredients are rice and vegetables but we can also find many stews made with regional seafood. 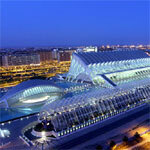 Valencia is famous for its lively nightlife, reason why people enjoy weekend "breaks" in the city. This lifestyle is not new, since it has been typical of the city and its inhabitants for centuries, never to cause detriment to others, but to make them happy. The noise and the fun are an important part of the society of Valencia, and this makes many visitors feel envious of the diversity of people you can find, since there is no defined age or class.